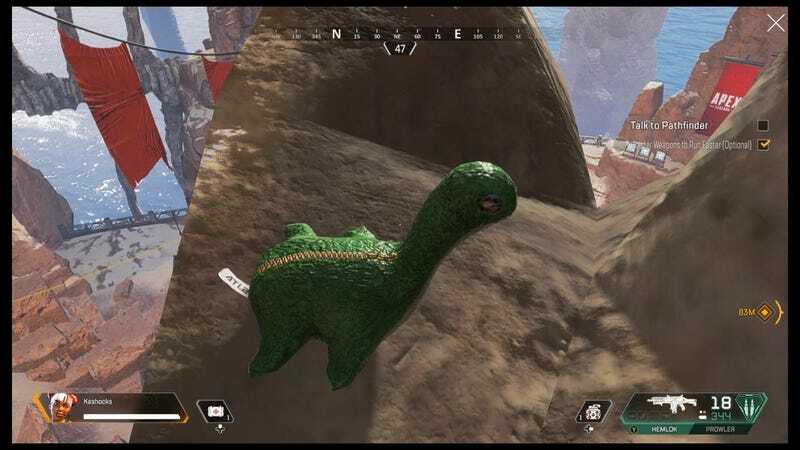 Soon after launch, Apex Legends players started finding plush dinosaurs on the map. Now players have discovered that these dinosaurs lead to an easter egg, and it’s pretty tricky to get. Titanfall players already know about Nessie, a plush dinosaur who is hidden in all the levels of Titanfall and Titanfall 2. The fact that she’s now showed up in Apex Legends isn’t a huge surprise; players started finding her hidden in the training map very quickly. Soon after that, players were able to put it together that the “A Nessie Appears” message meant that a Nessie had spawned on the map. They also quickly figured out that if you shoot a Nessie, a new Nessie will spawn somewhere else. After a few hours, players found all ten Nessies that you need to shoot, and streamer GarbageKogMain was able to see what happens when you manage that feat. Drift0r says in his video that the payoff for all the work that it takes to get this easter egg doesn’t feel worth it. Personally, I still think seeing a dinosaur is pretty majestic. Drift0r also recommends using Pathfinder if you want to do this yourself, as their mobility makes it easier to jump around to all the different locations you need to go to on the map. Happy hunting!